WELCOME TO THE BEST AXE THROWING LOUNGE! We are South Florida’s first indoor axe throwing experience offering competitive and recreational player-interactive targets. Learn how to throw guided by our axeperts and join our monthly leagues and competitions! Great for special occasions, a night on the town, and even corporate outings, we promise an experience you won’t forget! Bring your friends and family for an activity that’s out of the ordinary and fun for everyone! You can walk in anytime we’re open, or you can make your reservation online- which we highly suggest! We host special events too! Birthday parties, team building activities, and bachelor/ette parties are just some of the events we cater to. You can walk in or reserve an axe throwing game at $35 per person for 90 minutes of throw time. This includes a brief training session from one of our axeperts on either our WATL official targets or our digital, interactive target ranges. Want to throw longer? $10 gives you an extra 30 minutes of axe throwing action! We have 2 locations serving South Florida! Get your lumberjack on in Downtown Hollywood near ArtsPark at Young Circle, or visit our spacious Miami facility in Bayside not far from the American Airlines Arena. 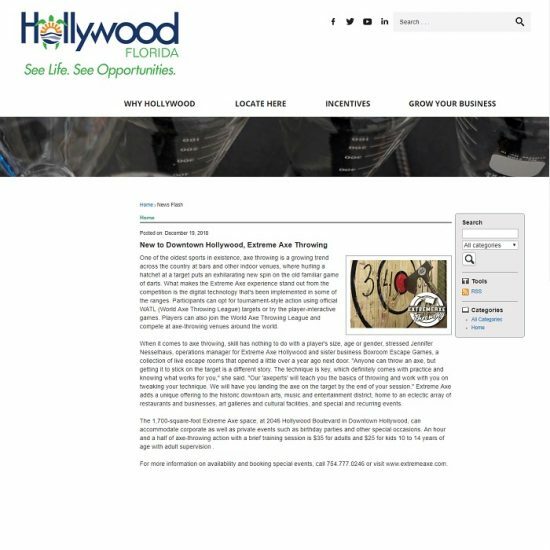 Click here: Miami or Hollywood to see axe throwing game availability and get more information on events at a location near you. GOOGLE REVIEW *****. We came here for a team building event and this place was absolutely amazing!! Staff was extremely nice and patient in teaching our group how to throw axes. Will definitely be coming back!! GOOGLE REVIEW *****. I went to throw some axes for my friend's birthday! When we first got there I felt very nervous and a little intimidated. After my "axepert" showed me the basics on how to throw and I landed my first shot I was addicted! So much fun! I will be bringing my boyfriend here for a date night! GOOGLE REVIEW *****. I went to Extreme Axe with some friends for a special soft opening event. OMG. I have not had this much fun in such a long time! Once I landed my first axe on the target I was completely hooked! After throwing we were able to hang out in the lounge. This place is beautiful. I can see me and my friends hanging out here a lot! Throw a kick-axe party that’s unforgettable! Click here for more information! Getting Married? Prepare yourself for that argument….you know it’s coming. Stick it to the man! Tired of the same boring team building activities? Be a kick-axe boss and bring the best out in your staff! Large and unique space suited for any special occasion. Get Early Access to Our New Venue Grand Opening and Specials!